Former National Basketball Association star Dennis Rodman said on Friday he will be heading to Singapore for the planned June 12 summit between U.S. President Donald Trump and North Korean leader Kim Jong Un. From summit-themed burgers and online scalpers peddling "World Peace" medallions and "Peace Out from Lion City" T-shirts, Singaporeans are cashing in on a historic meeting between U.S. President Donald Trump and North Korea's Kim Jong Un. It's one of the big questions looming over the Singapore summit. If Donald Trump strikes a deal with Kim Jong Un, what would an open North Korean even look like? Who would benefit from it and how would such a closed country open its economy to the world? 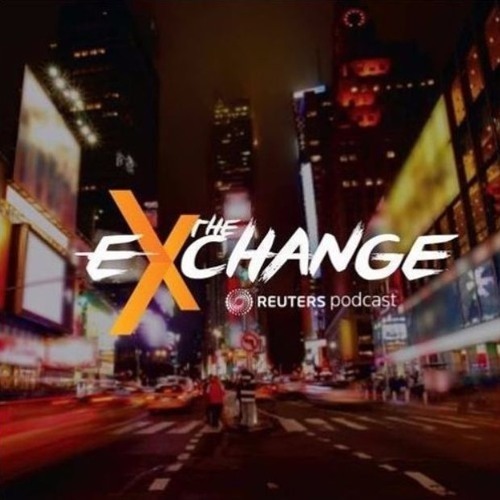 Reuters' Cynthia Kim explains. North Korean leader Kim Jong Un is expected to fly into Singapore's Changi airport on Sunday ahead of a high-stakes summit with U.S. President Donald Trump, a source involved in the planning of the trip said on Friday. 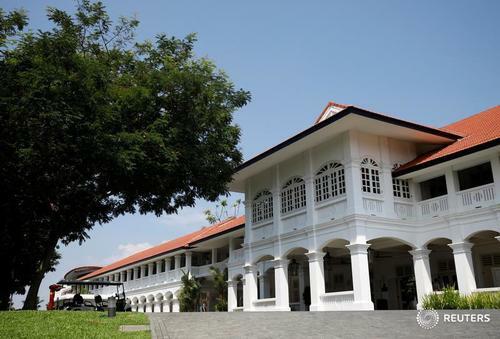 U.S.Two South Korean media staff have been arrested for trespassing at the home of the North Korean ambassador to Singapore, police said on Friday, just days before a high-stakes summit between the U.S. and North Korean leaders in the city-state. 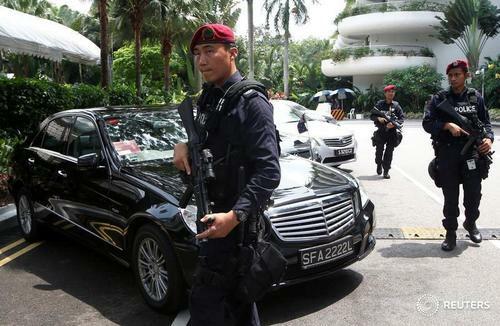 Two South Korean media staff have been arrested for trespassing at the home of the North Korean ambassador to Singapore, police said on Friday, just days before a high-stakes summit between the U.S. and North Korean leaders in the city-state. An Australian comedian known for impersonating North Korean leader Kim Jong Un said he was detained by Singapore's authorities on Friday and questioned about his political views. U.S. President Donald Trump said on Thursday it was possible he and North Korean leader Kim Jong Un could sign an agreement to end the Korean War at their June 12 meeting in Singapore and that he would someday like to normalize relations with Pyongyang. President Trump said he's prepared for his summit with Kim Jong Un, adding that "I don't think I have to prepare very much" and that's "it's about attitude." Reuters TVJust weeks after John Bolton’s hardline rhetoric infuriated North Korea and nearly derailed a planned summit between Kim Jong Un and President Donald Trump, the U.S. national security adviser appears to have taken a back seat to Secretary of State Mike Pompeo for the historic meeting. U.S.Stella Choi, the principal of a Korean language school in a drab tower in downtown Singapore, works just across the elevator lobby from the modest suites that make up North Korea's embassy. Changing tones: A look at ups and downs in the U.S.-North Korea relationship since both parties agreed to meet. 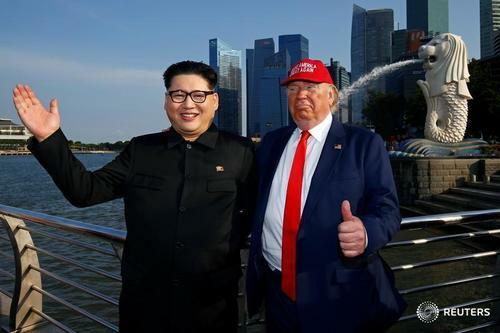 A planned summit between U.S. President Donald Trump and North Korea’s leader Kim Jong Un is back on for June 12 in Singapore. Take a look at the diplomatic ups and downs in U.S.-North Korea relationship since March 9, when both parties agreed to meet. (Reuters Breakingviews) - Former Australia Prime Minister Kevin Rudd gives the U.S. president some credit for his dealings with North Korea’s Kim Jong Un. But he explains that Donald Trump’s protectionism has enraged China’s leaders and may play into the hands of the country’s own nationalists. Singapore's Minister for Foreign Affairs Vivian Balakrishnan is set to arrive in Pyongyang on Thursday, the Singapore government said, days before it plays host to the leaders of North Korea and the United States at a summit. Singapore airspace will be restricted during the planned U.S.-N.Korea summit next week, according to a notice to airmen posted by aviation authorities on Wednesday, which is likely to result in delays at one of Asia's busiest airports. Japanese Prime Minister Shinzo Abe, seeking to draw on his close ties with President Donald Trump in talks on Thursday, will urge the U.S. leader not to forget Tokyo's security concerns and Japan's desire to return Japanese abductees in North Korea when he meets with Kim Jung Un. U.S. Secretary of State Mike Pompeo and Donald Trump's national security adviser, John Bolton, have pursued different approaches in the run-up to next week's summit between the U.S. president and North Korean leader Kim Jong Un in Singapore. Will Singapore's 'orchid diplomacy' extend to Trump-Kim summit? Heads of state, royalty and celebrities who visit Singapore often leave with a specially grown orchid, the national flower of the wealthy city-state, named after them. On a shelf in a cramped office on the outskirts of Moscow, businessman Igor Michurin has a framed photograph of himself shaking hands with one of his important customers - a North Korean embassy official whom Michurin calls Lee.